Jozi downtown treasure for theater goers. 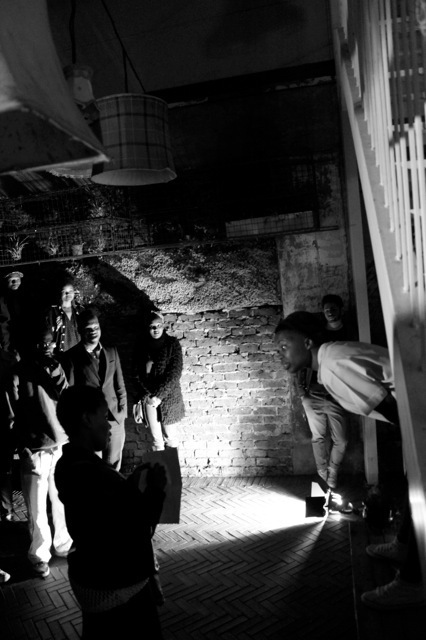 Theater goers in down-town Johannesburg were treated to a unique experience when actors Carla Fonseca and Phumzile Sitole put on a two-man show called 'SENT' at the Great Dane pub in Braamfontein. SENT is a captivating story based on a collection of letters. Some of its characters are gritty reminders of internal dialogue human beings have when faced with the complex circumstances of their lives. These are the voice inside our heads that berate us when we fall victim of our own character flaws or encourages us in our quiet and desperate moments. The two actors combine their love for story-telling and their shared experience of the social scene in Johannesburg by using a popular hang-out as a meeting point through which they can reach their audience. “We were two artists having a drink at a bar when the idea of putting on a play emerged. We figured why not bring theatre to a young audience in a space that they frequent, “ says Phumzile, who is currently studying towards her master’s degree in acting at the University of Columbia in New York. The actors creatively combine performance art and multi-media to take their audience on a journey that explores their complex characters. As a site specific play, the audience becomes involved in the organic performance rather than sitting on a chair. While soap operas and tele nova’s like Isibaya and Generations are generating wide audiences in SA television, Fonceca believes that theatre culture in Johannesburg is dying out. “Young adults would rather watch a movie on a flash drive,” says Fonseca who describes her work as “Avant-Garde.” The challenge, she says, is creating a theater experience that depicts more than an ordinary story. “Theatre should not compete with TV, it should offer an experience that can only be told in a live performance,” she adds. SENT be showing at POP Art Theatre on the 22nd and 23rd August.